Fun facts about Celtic folk festivals and how to celebrate them today. In the Celtic calendar, 20-21st March is the festival of Ostara; the Spring Equinox. It is a time of new beginnings, of birth and rebirth, and plentiful supplies of chocolate eggs. Yummy. The Celtic Wheel of the Year features heavily in my children’s series, Equinox, as the quarter-points of the year (the Spring and Autumn Equinoxes  ; the Summer and Winter Solstices) are traditionally the points at which the barriers between the Fae and human worlds are at their thinnest. Merry Mabon! Celebrate the end of the summer with fun, games and, of course, food! This year, the feast of Mabon, or, the Autumnal Equinox, falls (no pun intended) on the 22nd of September. Samhain, (pronounced saa-win or saa-ween) falls on 31st October. Although it’s more commonly celebrated as Halloween, I’ll be focusing on the older traditions of the festival as this blog is part of my Celtic Wheel of the Year series. Gather around the cauldron, folks, and let’s get started! Samhain, in the Northern Hemisphere anyway, is the celebration of the last Harvest of the year. There are three Harvests in a Celtic year – the first being Lammas, the second being Mabon. Due to the importance of agriculture in the past, the third and final Harvest is seen by many as the end of the old year/start of the new. 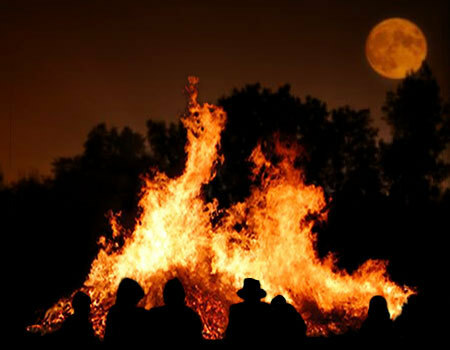 Samhain was originally celebrated in Europe as a Celtic Fire festival and, although many think of Samhain as being on the 31st October, some celebrate it over several days and nights. These celebrations can last until November 6th (which is nearer the astronomical mid-point between Mabon and Yule). There’s a reason we associate October and November time with big bonfires and fireworks, and not all of it has to do with a certain Mister Fawkes! As the festival marks the start of the coldest and darkest months of the natural year, it’s no surprise that it’s also seen as a Festival of the Dead across many religions – think All Hallows Eve and Día de Muertos. It is a time to remember loved ones and those who have passed on. The Celtic festivals play an important role in my Equinox Series. Samhain is steeped in Irish Mythology and, like Beltane, it’s seen as a time when the boundary between the human world and the spirit world can be more easily crossed. This means that the Fae folk – nature spirits – could visit humans, as well as the souls of the dead. It was believed that the Fae needed to be appeased and paid tribute to on Samhain, and so food and drink were left outside for them. The festival also traditionally involved mumming (disguising oneself, possibly as a way of protecting oneself from malevolent Fae) and involved people going door-to-door in these costumes, reciting verses in exchange for food. Sounds a bit like our modern Trick-or-Treating!